INTRODUCTION – Most single-incision laparoscopic cholecystectomy procedures described to date were done with the patient in supine position. Although convenient for the operating surgeon (standing on the patient’s left), we found this position to be taxing on a surgical assistant (who stands on the patient’s right). To alleviate the strain on the assistant’s back we recently started positioning our patients on a split-leg table with the surgeon standing between the legs and assistant standing on the left side of the patient. This resulted in improved ergonomics for both operators and decreased instrument interference. METHODS AND PROCEDURES – Records of 46 consecutive patients undergoing single-incision laparoscopic cholecystectomy by the primary authors were reviewed. 27 cases (59%) were done with the patient supine and 18 (41%) were performed on a split-leg table with the patient in a modified lithotomy position. During surgeries performed in supine position, surgeon stood on the left of the patient and assistant was on the right (Fig. 1). We noted that to properly direct a laparoscope into right upper quadrant, assistant had to lean far over the patient to the right side. This resulted in increased straining of the assistant’s back. Additionally, interference was noted between the outstretched arm of the assistant and the surgeon’s instruments. With the patient in lithotomy position, the surgeon stands between the patient’s legs and the assistant is on the patient’s left (Fig. 2). Both operators are now able to easily direct the laparoscope and working instruments towards the right upper quadrant. Assistant does not need to reach over the patient and is able to keep the laparoscope from interfering with the surgeon’s instruments. 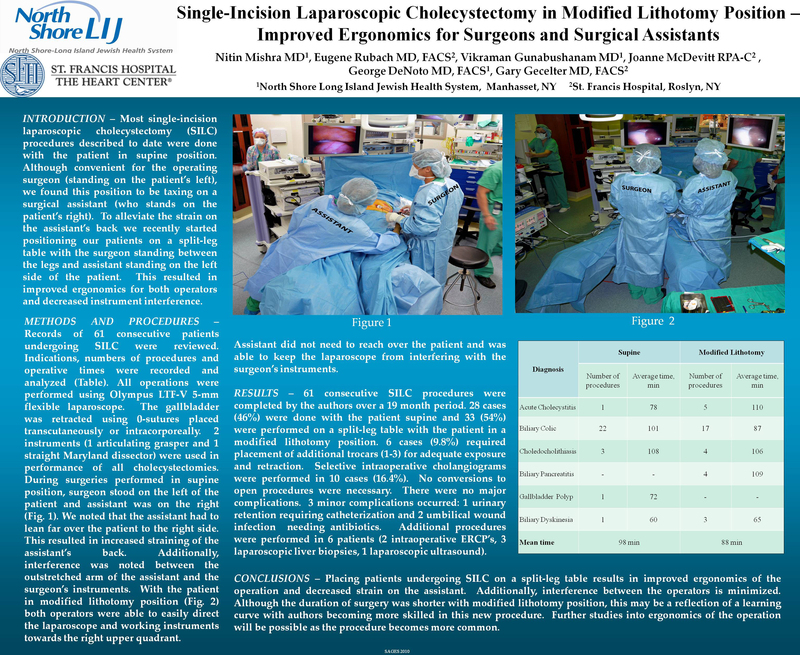 RESULTS – 46 consecutive single-incision laparoscopic cholecystectomies were completed by the authors. Indications for the procedures included acute cholecystitis (5 patients, 11%), biliary colic (31, 67%), choledocholithiasis (5, 11%), biliary pancreatitis (2, 4%), gallbladder polyp (1, 2%) and biliary dyskenisia (2, 4%). 5 cases (11%) required placement of additional trocars for adequate exposure. Selective intraoperative cholangiography was performed in 5 cases (11%). No conversions to open procedures were necessary. There were no major complications. 2 minor complications occurred: 1 urinary retention requiring catheterization and 1 umbilical wound infection requiring antibiotic treatment. Average duration of the procedure was 78 min for patients placed supine and 65 min for patients operated on in lithotomy. CONCLUSIONS – Placing patients undergoing single-incision laparoscopic cholecystectomy on a split-leg table results in improved ergonomics of the operation and decreased strain on the assistant. Additionally, interference between the operators is minimized. Although the duration of surgery was shorter with lithotomy position, this may be a reflection of a learning curve with authors becoming more skilled in this new procedure. Further studies into ergonomics of the operation will be possible as the procedure becomes more common.